pulsFOG has just been featured on hortidaily.com the online meeting place for the international horticulture industry. The website brings you daily industry news from around the globe. HortiDaily intends to provide as much information as possible, which could help growers with the management of their horticultural enterprise. pulsFOG has been interviewed about the treatment of those ever increasing sizes of greenhouses. You can read the full article on hortidaily.com. The average size of a modern greenhouse operation has significantly increased over the past years. Due to this, not only have common techniques for such things as energy supply, irrigation or logistics been scaled up, but also the application techniques for crop protection, like fogging, have been adapted to modern requirements. According to Mathias Stahl from pulsFOG, more and more growers are asking for bigger materials to treat their greenhouses in less time. "Scaling up is a trend, but we have to keep in mind that it is not always useful to have the biggest machines, due to the possible loss of control and accuracy." Since the foundation in 1968, pulsFOG has grown to one of the leaders in the development and manufacturing of fogging machines that can be used for crop protection and disinfection. To fulfil the wishes of their end-users, growers are closely involved in the designing process of their machines. "In most cases, growers want fast and big machines, that are accurate and labor saving at the same time", Stahl said. "We are able to reach this target for the most part, but in some cases, we have to convince them that scaling up your fog is not always the best solution. For example, pests like spider mites, leaf miners, white fly, thrips or fungus diseases each need their own optimum droplet size. So the sizes of the droplets are very important for the effectiveness of the crop protection treatment. The bigger the machine is, the harder it is to get a very accurate droplet size in a low spectrum. The need is there, and of course we develop machines and additives for the pesticide fogging formulation to answer the need of our customers. However, we also provide other services and inform them on how they can treat a big area within the same amount of time with a smaller machine in a better way. 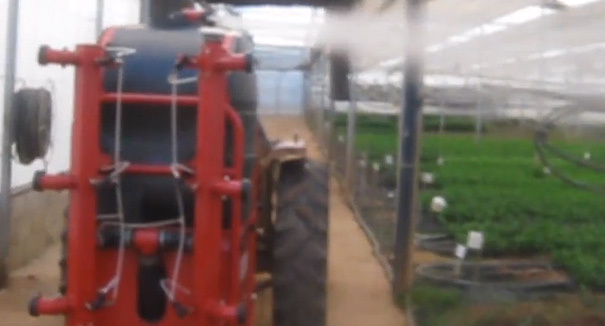 For example, if a grower is now walking with a spray gun into every two rows, we inform him on how he can save time by using other additional techniques like a ventilation system. “Everything is an individual case,” pointed out Stahl. Because a variety of factors need to be considered when trying to find the right treatment for crop protection or greenhouse disinfection, good guidance is essential. It's for that reason that helping customers after they've bought their fogging machines is important for pulsFOG, and that makes the network of representatives very helpful. “Sometimes the challenge is to make it clear to growers what they need,” said Stahl. He noted that growers sometimes get the impression that atomization, where a fine mist of particles smaller than five microns is applied, is what's needed when standard mists, which are much cheaper and easier to apply, are more than sufficient. But one must know, Stahl says, those small droplets (< 10µm) have a very little "regain-rate", meaning the droplets are too light-weighted and vanish too quick! Hence, to convince the end customer (grower) for the right application can sometime be quite challenging. In such and similar cases it is very important, having representatives who know their respective application field in the prevailing country and are familiar with the customers requirements and needs. Based in Germany, pulsFOG sells the overwhelming majority of their fogging machines to customers abroad. Although they have a subsidiary in Brazil, providing after-sales service to all of their customers who wish to use their fogging technology is unfeasible with just two offices, so pulsFOG uses a network of representatives around the world to help with that. “We're based in Germany, but we operate worldwide,” said Stahl. “We export 98 percent of our machines.” In order to provide support to all of those customers abroad, Stahl said they have a network of companies around the world who are both customers of pulsFOG and also provide after-sales service in their respective countries. “The companies themselves are independent of pulsFOG, but they're customers of ours who also sell our products,” explained Stahl. “Since we're not a huge company with hundreds of employees, we can't do all the servicing from Germany, that's why we have representatives in different companies and countries to provide after-sales help.” The help those representatives provide includes suggestions on how to best use equipment and guidance on how to achieve specific grower goals.